Android G1 Accelerometer from Eric Burke on Vimeo. I initially thought my phone was defective, because the same game works for other people. But another game, Papi Jump, works fine after calibration. Before calibration, that game also pulls hard to the right. That boolean result is true if the device supports the requested sensor, so it returns false on the emulator and true on the G1 phone. The SensorListener has two methods: onAccuracyChanged(...) and onSensorChanged(...). My example updates the GUI whenever the sensor changes. Disclaimer: if you update the GUI on every single event, your application will slow down, the garbage collector will kick in repeatedly, and your app will probably crash. The events from the sensor arrive very fast, faster than the GUI can display. If you check out the complete code, you’ll see I intentionally slow down the GUI updates to once every 100 milliseconds. The screen shot illustrates the “problem” with my phone and the Labyrinth Lite game. The X, Y, and Z values constantly change. When the phone rests on a level surface, X and Y should be around zero. On my phone, however, X is approximately 0.83. 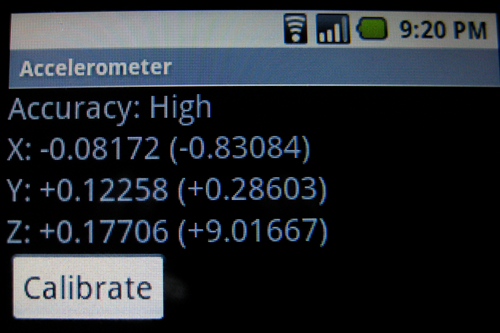 My application stores three values representing the calibration. When you click the Calibrate button, I store the negative X, Y, and Z values in three variables: cx, cy, and cz. Those are the numbers shown in parenthesis. When I display the values for X, Y, and Z, I simply add cx, cy, and cz to the current sensor readings. The Papi Jump game seems to calibrate just fine. I suspect they do exactly what I do: detect how far out of whack the phone’s sensor is, and apply that delta to the current sensor readings. For whatever reason, Labyrinth fails to calibrate enough on my phone. I believe this is a bug in their application. Perhaps the phones they test with do not require as much calibration as my phone. I have read reports from several people who say Labyrinth works on their phones, and it works on my wife’s G1 as well. My phone sensor clearly works, it just requires around -0.83 X-axis adjustment. Is this within acceptable tolerance? I do not know. I do know, however, that game developers cannot assume all Android hardware is perfectly calibrated. Games like Labyrinth need to expect a wider range of hardware and adjust accordingly. Papi Jump does it, and my simple demo is able to calibrate with a trivial subtraction. The complete source code is available in my Android Game Examples project on GitHub. Posted on Sunday, March 15th, 2009 at 9:54 pm in Android.